We really love receiving updates from our adopters, especially when they are getting such enjoyment from their adopted horse or donkey. Titos and Archie, who were adopted last year, are having a wonderful time down in the Lot where they are always out and about in the countryside going for walks with their human friends. Donkeys are often overlooked when it comes to doing things and all too often they end up never leaving their field, which is very sad. 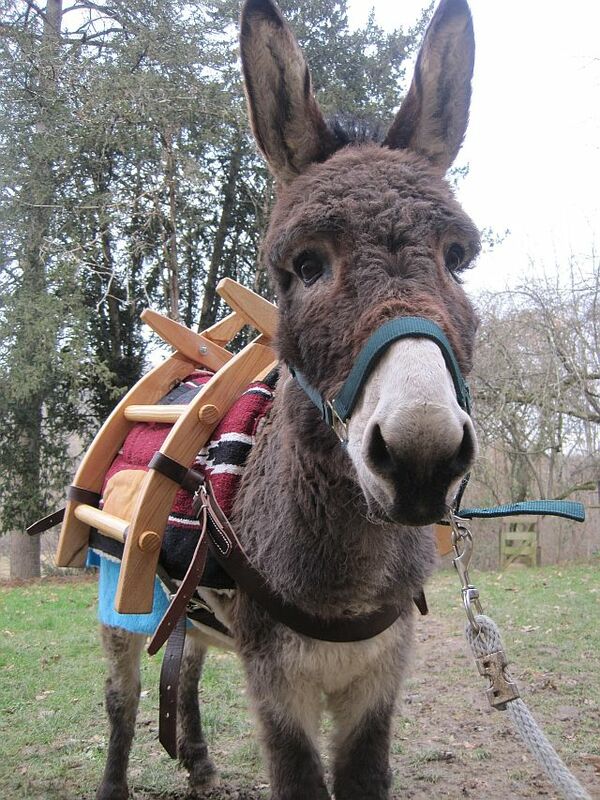 Most donkeys will thrive, both emotionally and physically, on doing something in their lives. It doesn’t have to be ridden or driven work, simple walks out in hand will keep them interested in life, create a good relationship with their carer and is also good for their feet. 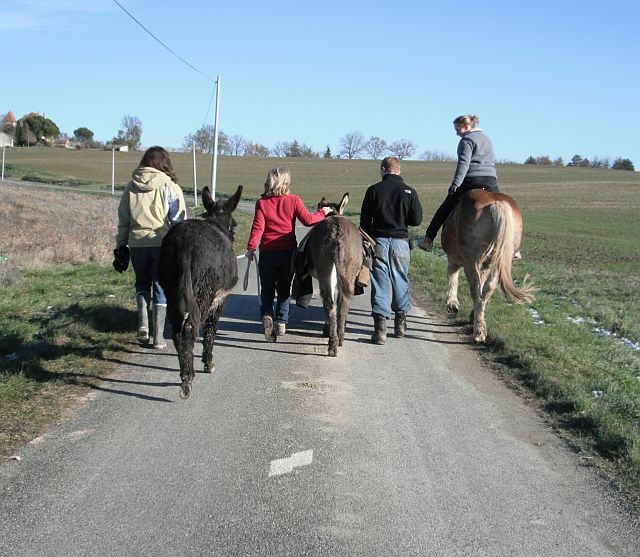 I can’t explain exactly what the donkeys get from going out, but obviously a great deal. Honestly with Titos & Archie they always follow me to the gate hoping that I’ve got the head collar & they’ll be the lucky one chosen. I have to push whoever’s not coming back so I can get out myself. I tried taking them both out by myself but got in a bit of a knot with the two leads, not that it can’t be done but it’s not as easy or relaxing. I got some great hints about how to get the most out of donkeys from the Donkey Society of Western Australia Inc. When I first got Titos he was a bit shy to catch although once I had the head collar on he was impeccable. Archie, I couldn’t get him to walk more than 10m down the lane before he came to a complete stop, and as you know nothing can make a donkey move if he doesn’t want to.He just didn’t understand what I wanted, didn’t trust me and didn’t know where I was taking him. 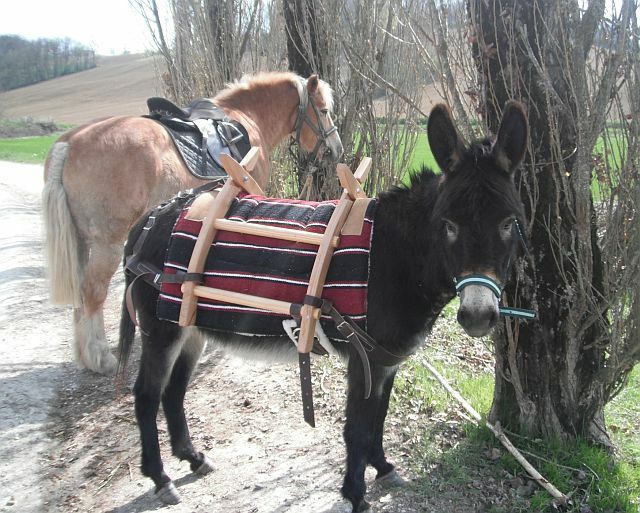 I think this is probably an experience that people have frequently, get cross, feel embarassed and they then label the donkey as stubborn and give up. Armed with the information I got from the attached pages I encouraged him greatly and when he stopped & refused to go any further I pulled the lead slightly sideways unbalancing him & forcing him to put one foot sort of forward, then told him what a clever old donk he was, turned round & took him back to the meadow. Within a week he’d follow me anywhere! Take a look on the Donkey Society of Western Australia’s website as there’s some interesting and amusing articles on there. We hope you are feeling suitably enthusiastic now about getting your donkey out and about this year, and most importantly that you both or all…HAVE FUN! !